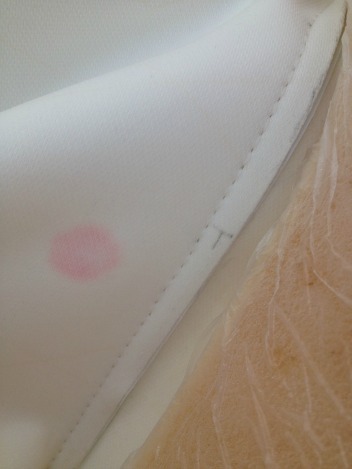 Pink Stains On Your Boat Cushions, what now? 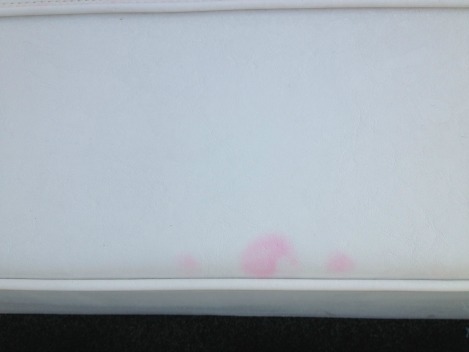 Pink Stains On Your Boat Cushions? Consider this…you just spent 5K on a new interior for your boat and within 6 months you start seeing pink stains on your boat cushions that looks like spilled Kool-Aid all over your upholstery. Nothing you do is working to remove it and even though you’ve owned several boats over the years, you’ve never had this happen before. So you contact the marine upholstery expert who completed the job, and tell them all about it thinking that maybe they’ve used an inferior vinyl. Your upholstery person is freaking out because they just concluded 40 hours of labor on your project. They in turn contact the distributor on your behalf and then call to tell you that the manufacturer will not take responsibility. The manufacturer even said, “We are not at fault. Your customer should have kept the boat dry.” The truth is , these stains can be all sorts of colors and no matter the color, they are a big problem. You will notice the pink stains on the boat cushion on the inside of the cushion. The stains go all the way through. Vinyl pink stains is a relatively new problem in the boating industry, and many experts disagree on the causes. The most common answer is marine vinyl no longer contains chemicals such as arsenic because the EPA required manufacturers to remove them. These chemicals killed the pinking micro-organisms that breed in wet, warm , dark places. It’s occurring because vinyl is being made with cheap off-shore resins. Whatever the reason, pink staining is a bad and primarily happens to white and off-white marine vinyl, but it’s not seen as much in colored vinyl. In an effort to avoid the problem, boat manufacturers have begun using a lot of khaki colored vinyl in their cockpit interiors. What To Do About Pink Stains On Your Boat Cushions? Sunshine does help these stains fade. You will notice that leaving the covers off for a couple of days and letting the sunshine hit it, the stains will begin to disappear. Cover it up and back they come. If you are considering marine upholstery and would really like it to be a light color, try Silvertex® by Spradling International. This fabric is top coated with an ionic silver coating that is highly effective as a deterrent to all bacterial growth and is known to inhibit odor and stain causing bacteria. Feel free to read about it here and also take a look at the available SILVERTEX® colors. If you already own a boat that has a pinking problem, you can contact the makers of Pink Away and get a referred to someone who has invested in their removal system. Lastly, do try to keep your boat as dry, clean and covered as much as possible and talk to your fabricator about what steps you can take to decrease the possibility of this happening to you.